Simsbury Park and Disc Golf Course is one of the premier locations in central Ohio for a sport that combines elements of golf and Frisbee. The 18-hole course, which backs up to the Simsbury subdivision, serves as the host for Professional Disc Golf Association (PDGA)-sanctioned tournaments. Parks and Recreation Board Member Brandy Bagar-Fraley says the disc golf course is one of Pickerington’s most unique and entertaining parks. “It boasts a well-designed and well-reviewed disc golf course that garners positive reviews across social media, and draws both experienced and inexperienced disc golfers,” Bagar-Fraley says. Disc golf is a challenging sport that involves throwing a disc (Frisbee) at a target and is played using rules similar to traditional golf. The Simsbury Disc Golf Course sprawls across more than 31 scenic acres of the approximately 37-acre park. It was designed by Columbus Flyers Disc Golf Club President Paul Jay in 2008. “We are told that it is one of the better courses in the Columbus area,” Rebecca Medinger, City of Pickerington Parks and Recreation director, says. Each May the Columbus Flyers Pickerington Classic is held on the course. This year, the Columbus Flyers Brent Hambrick Memorial Open was held for the first time in June. While the course draws disc golf enthusiasts from all around central Ohio, Bagar-Fraley says the park is a favorite destination for walkers and runners and it has a lot to offer the Pickerington community. In addition to disc golf, the park features a picnic shelter, playground with swing set, restrooms and plenty of parking. And when snow covers the course, Medinger says the park is a favorite destination for avid cross-country skiers. Because Simsbury Park and Disc Golf Course is so large, Medinger says there is always something her department is doing to the park and other Pickerington parks are in pristine condition all year long. This year Parks and Recreation budgeted about $519,000 for renovations, improvements and equipment for the parks it maintains. At the Pickerington Community Pool, funding was used to replace two existing diving boards and stands and the addition of a 50-gallon water dump bucket, frog spray, dueling water squirters, and other water sprayers. Sycamore Creek Park men’s and women’s restrooms were expanded this summer and the parking lot was expanded and paved. The parking lot at Victory Park was also expanded from 35 spots to a total of 80. Restrooms at Victory Park are also expected to be renovated in the fall. Over the summer, Colony Park gained a 72-by-80-foot surfaced playground with many features including slides and swings for ages 3-12 years old. Visitors to Willow Pond Park will also notice the new two-bay swing set, which includes two swings, a toddler swing and a bucket seat. The City of Pickerington is now flying high over many cities, states and even countries. On June 22, the Ohio Air National Guard dedicated one of its refueling planes, a KC-135, to the city. Ohio Air National Guard Maj. Jody Schweickart, wing executive officer of the 121st Air Refueling Wing, says that the dedication program is meant to create partnerships with local communities that have supported the Ohio Air National Guard over the years. 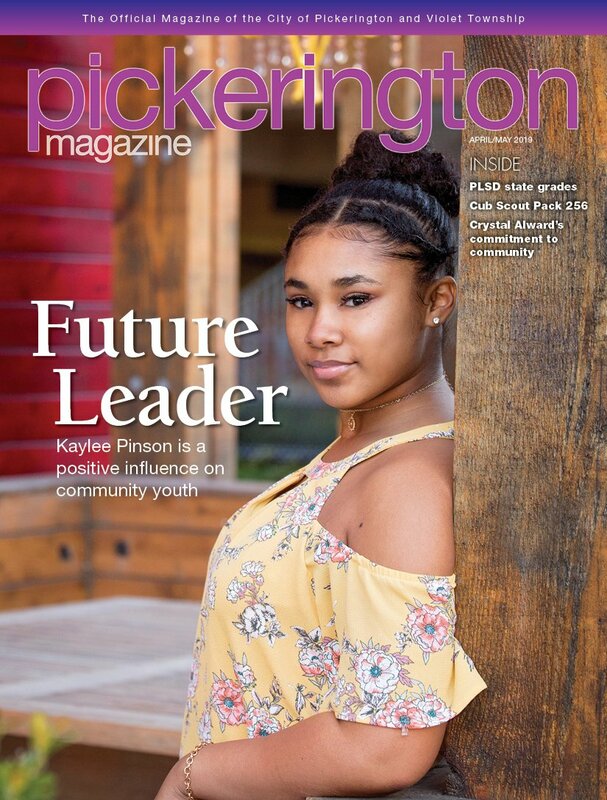 “A lot of our members live in Pickerington and we think this helps foster unit pride, community pride and foster our relationship with the city,” Schweickart says. “It’s an incredible honor to have this plane dedicated to the city, but the real honor goes to the men and women from our community who serve,” he says. There is no cost for the city to participate in the program. Currently, there are five other cities that have planes dedicated to them including Westerville, Groveport, Grove City, Lockbourne and Canal Winchester. And the next mission may involve the newest ambassador, officially known as the Pride of Pickerington, soaring through the skies to refuel planes or help communities in need of support.